Our accommodation in Galashiels is a family run traditional and welcoming Inn which offers exceptional food and atmosphere. 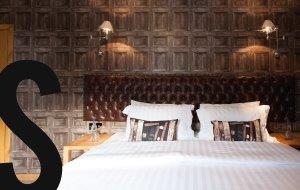 Our rooms are traditionally furnished with panelled feature walls, chesterfield headboards, custom made furnishings and stylish accents unique and luxurious in all rooms. We offer a great range of spirits, wines, local real ales and jam jar cocktail that can’t be missed. Our now famous sticky chicken salad needs to be tasted, there are three to choose from chilli or mango all made with love using locally sourced produce. Also local beer battered fish and chips, slow cooked beef Guinness pie to name but a few. It is hard to disguise our pride when it comes to our beautifully designed modern luxurious inn and accommodation in Galashiels.